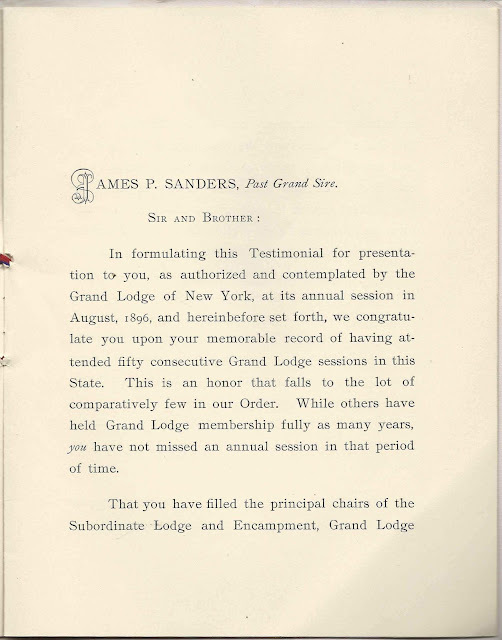 Booklet entitled "Testimonial to James P. Sanders, Past Grand Sire, Presented by the Grand Lodge of the State of New York of the Independent Order of Odd Fellows". James P. Sanders overcame the early death of his parents to become an attorney at Yonkers, New York, and important member of the Independent Order of Odd Fellows. 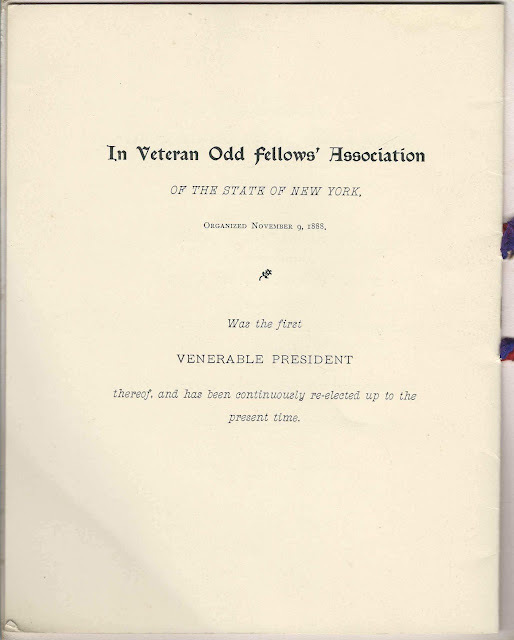 Read a brief biography of him on pages 773-776 in The Official History and Literature of Odd Fellowship: The Three-Link Fraternity, by Henry Leonard Stillson, published in 1897. 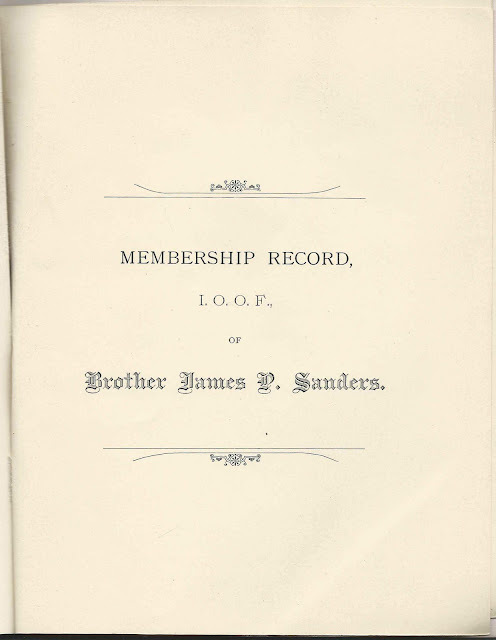 James P. Sanders lived at Danbury, Connecticut for a time and was perhaps born there; I don't have the names of his parents. 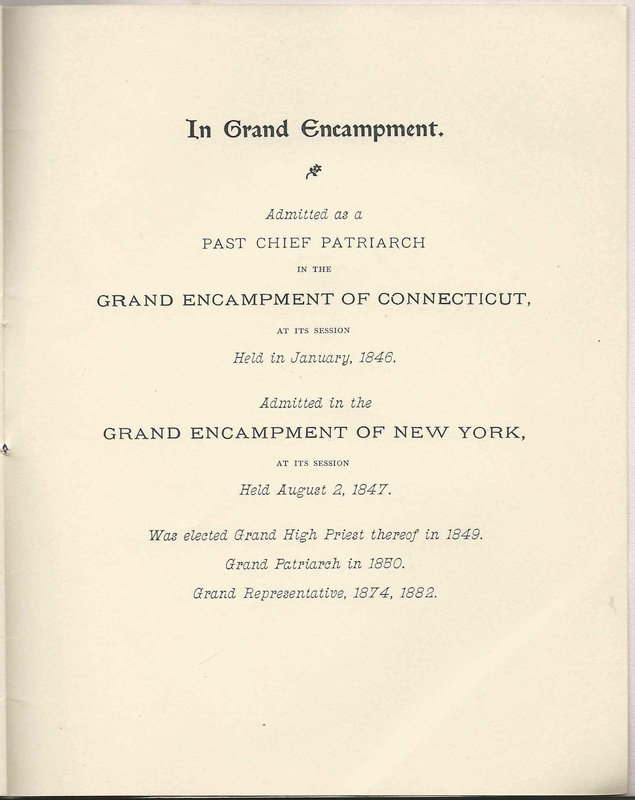 He lived at various times at Danbury, Connecticut; Peekskill, New York; Cortlandt, New York; and Yonkers, New York. 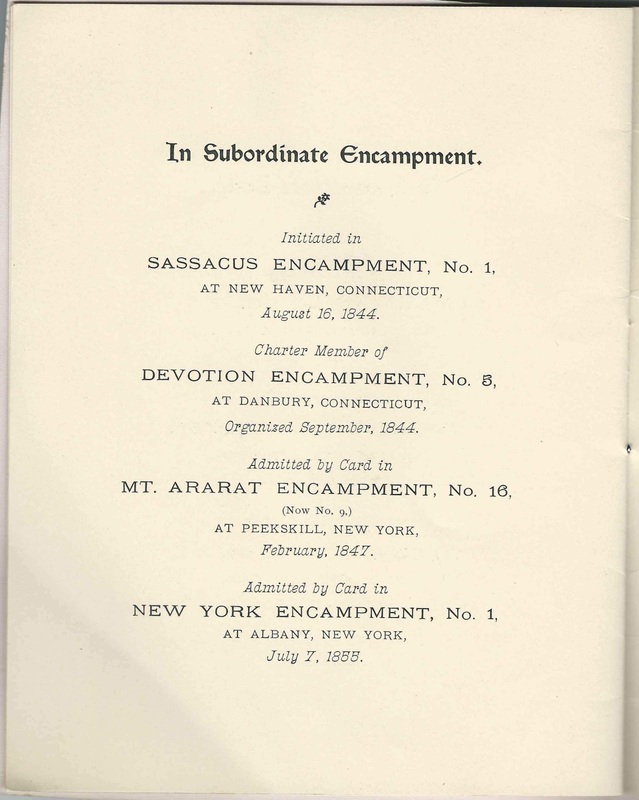 He married Elvina L. Ferguson at Danbury, Connecticut, on November 19, 1840, according to a record in Connecticut Marriages, 1630-1997. If you have more information on James P. Sanders, please leave a comment or contact me directly. 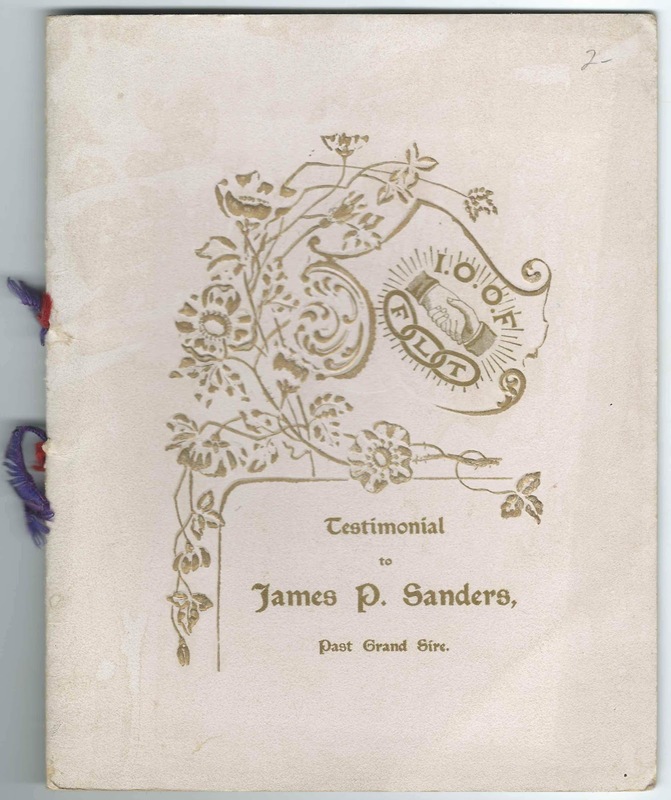 The booklet measures a bit over 8-1/2" by 6-1/2" and consists of 9 interior sheets, with text on both sides of most of them, and with a engraving of James P. Sanders. 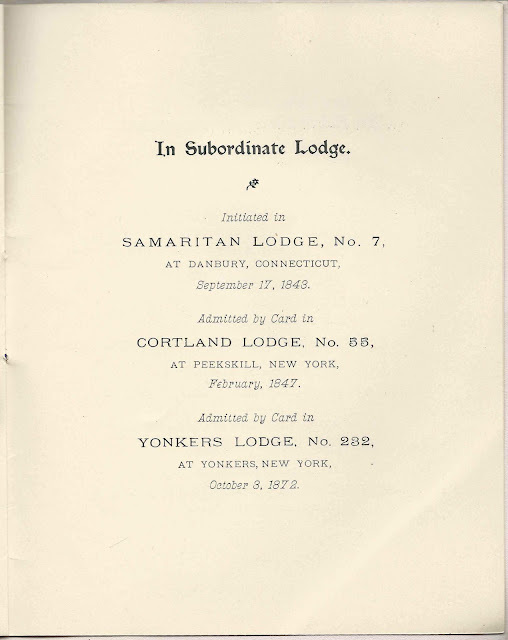 Printed by John Medole & Son of New York. 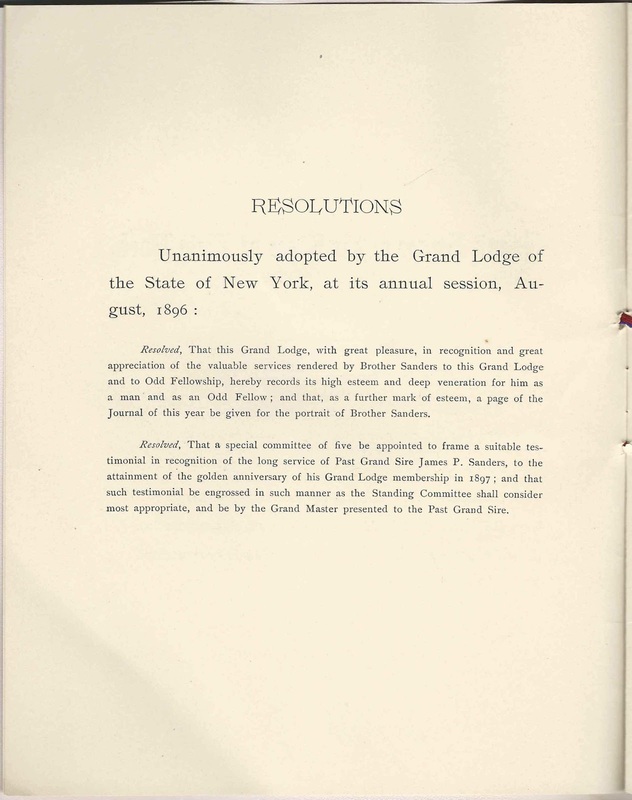 Resolved, That this Grand Lodge, with great pleasure, in recognition and great appreciation of the valuable services rendered by Brother Sanders to this Grand Lodge and to Odd Fellowship, hereby records its high esteem and deep veneration for him as a man and as an Odd Fellow; and that, as a further mark of esteem, a page of the Journal of this year be given for the portrait of Brother Sanders. 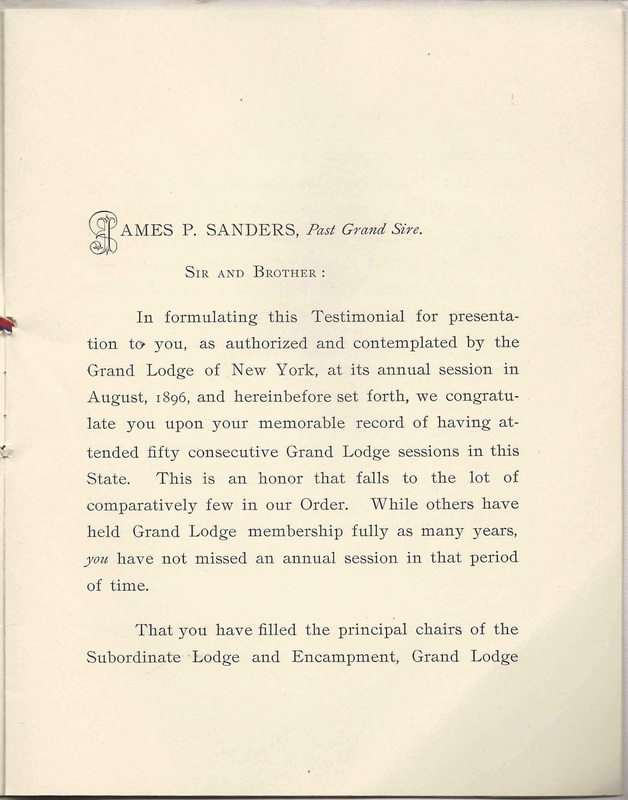 Resolved, That a special committee of five be appointed to frame a suitable testimonial, in recognition of the long service of Past Grand Sire James P. Sanders, to the attainment of the golden anniversary of his Grand Lodge membership in 1897; and that such testimonial be engrossed in such manner as the Standing Committee shall consider most appropriate, and be by the Grand Master presented to the Past Grand Sire. In formulating this Testimonial for presentation to you, as authorized and contemplated by the Grand Lodge of New York, at its annual session in August, 1896, and hereinbefore set forth, we congratulate you upon your memorable record of having attained fifty consecutive Grand Lodge sessions in this State. This is an honor that falls to the lot of comparatively few in our Order. While others have held Grand Lodge membership fully as many years, you have not missed an annual session in that period of time. 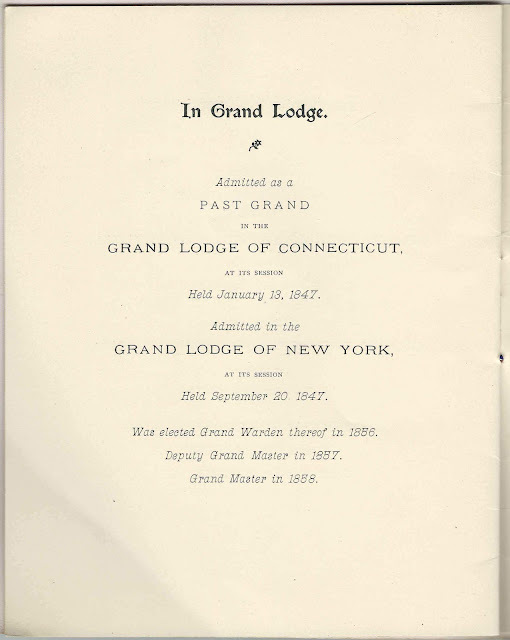 That you have filled the principal chairs of the Subordinate Lodge and Encampment, Grand Lodge and Grand Encampment, and of the Grand Lodge of the United States (now the Sovereign Grand Lodge), and served many years as Grand Representative to that Body from New York, fully testify to your long and faithful service, in and ardent attachment to and love for, American Odd Fellowship. 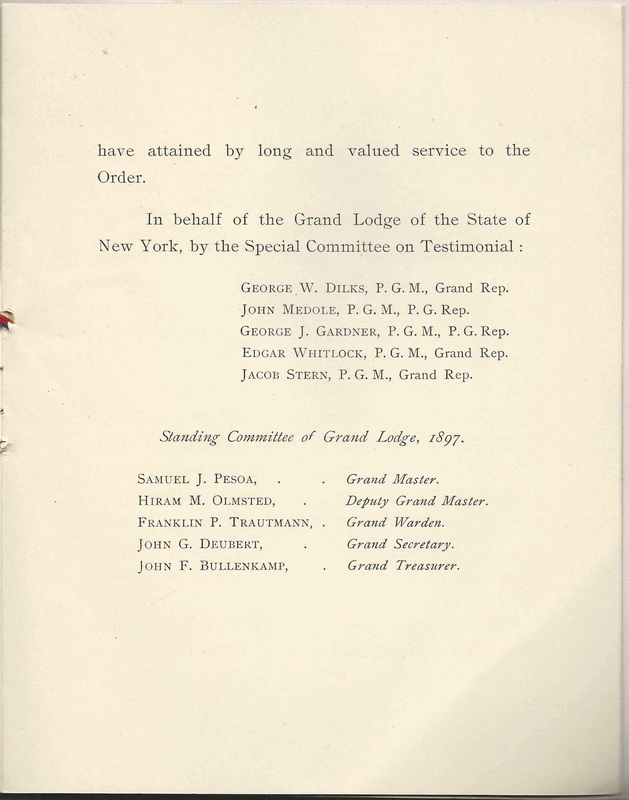 Were further evidence needed, your annual attendance at the sessions of the Sovereign Grand Lodge, and service upon its most important committees, might well be cited. 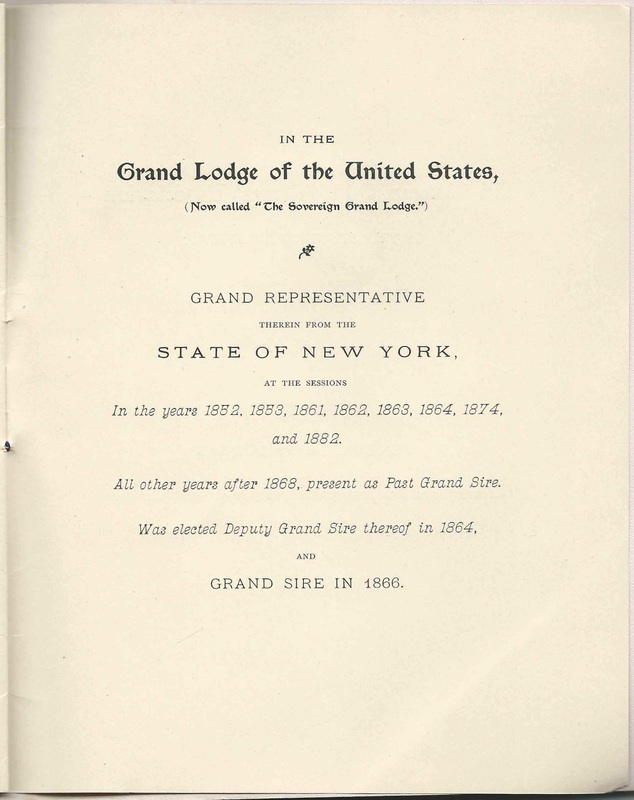 In that Body you have long ranked high in the estimation and good-will of its officers and Representatives. While they are displaced by others at longer or shorter intervals, you are always there. 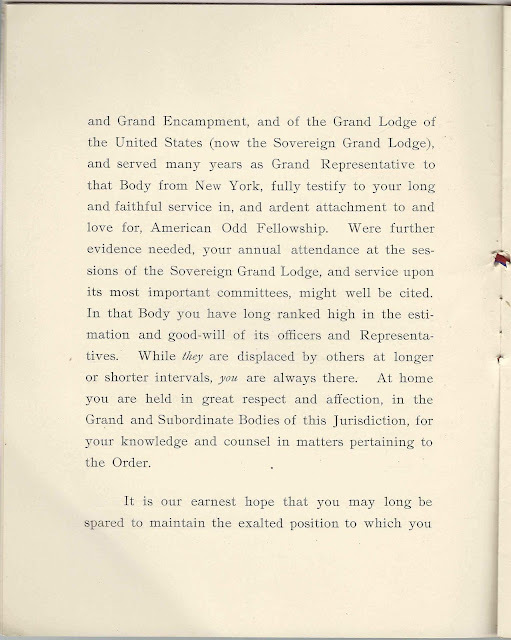 At home you are held in great respect and affection, in the Grand and Subordinate Bodies of this Jurisdiction, for your knowledge and counsel in matters pertaining to the Order. It is our earnest hope that you may long be spared to maintain the exalted position to which you have attained by long and valued service to the Order. 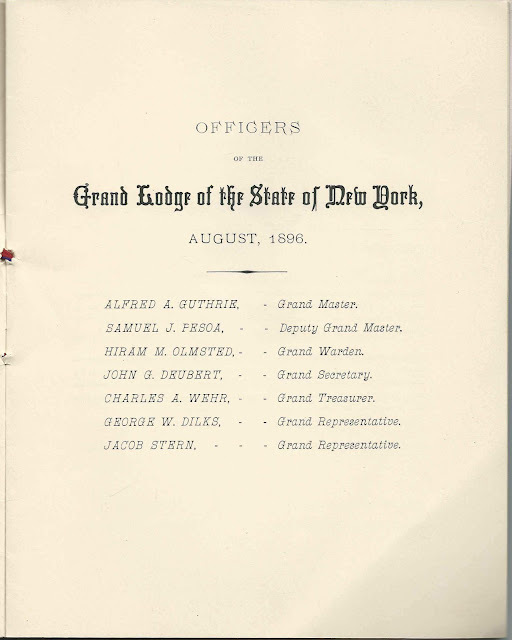 George W. Dilks, P.G.M., Grand Rep.
John Medole, P.G.M., P.G. 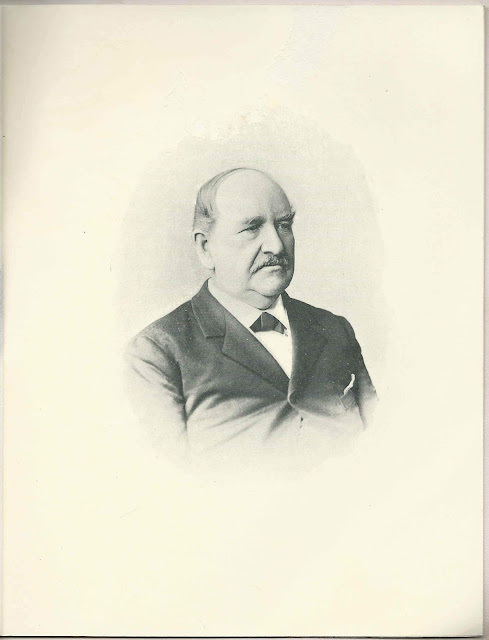 Rep.
George J. Gardner, P.G.M., P.G. 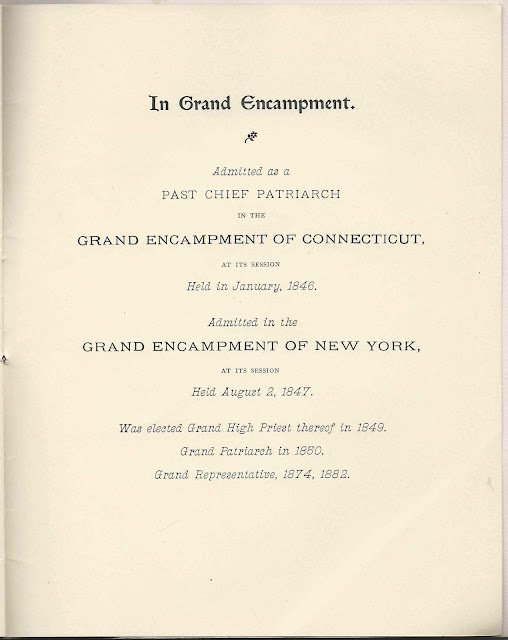 Rep.
Was elected Grand High Priest thereof in 1849. Was elected Grand Warden thereof in 1856. Deputy Grand Master in 1857. 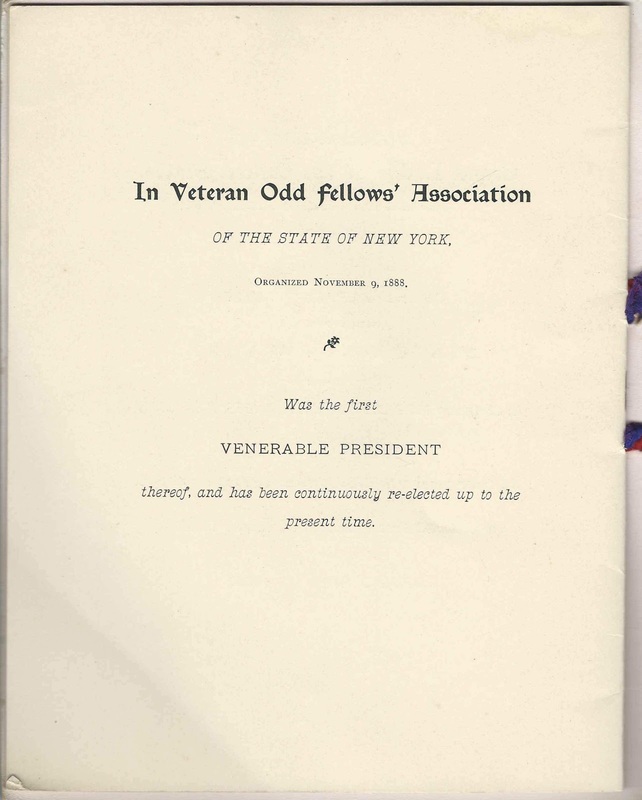 Was the first Venerable President thereof, and has been continuously re-elected up to the present time.